Help celebrate the nativity of the Blessed Virgin Mary with these cute printable table setting, party pieces and activity sheets, which highlight her birthday. Whether you want to have a special family meal or an actual party, celebrating Mother Mary’s birthday is sure to be a fun and memorable experience for young Catholics. 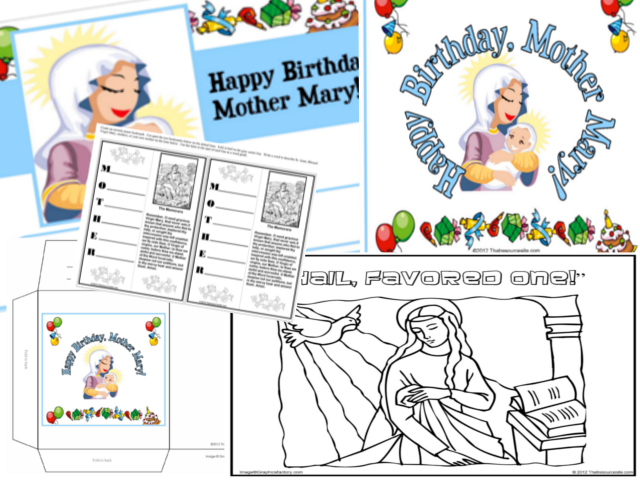 This printable download Happy Birthday, Mother Mary Party Set includes the following. Mother Acrostic Bookmark featuring St. Anne, Mother Mary, and Jesus.